Mobility – In some cases, the entrance to a facility may move over time. 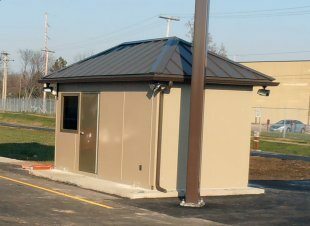 Many designs for modular gatehouses use portable-style structures that are easy to move when desired. This makes it easy to move the gatehouse from one place to another, depending on where it is needed. Ease of Construction – Building modular gatehouses is a simple process, because the plans and materials for the house are all in one place. The construction workers can easily set up a gate house in just a few hours without waiting around to find missing parts or deciphering complicated construction plans. Cost effectiveness – Because the buildings are partially completed in a warehouse with many other similar buildings, the cost of building a modular structure is much less, due to the bulk pricing of the unit.